Notes: Nannerch was opened by the Mold & Denbigh Junction Railway on 12.9.1869 as part of its line linking Mold to Denbigh. It was located about half a mile from the village of Nannerch. The line was built as a double track route and Nannerch Station was provided with two platforms which were linked by a simple barrow crossing at the north end of the station site. A substantial brick built building was located on the eastbound (Chester Direction) platform which provided the usual booking and waiting facilities as well as a two story house for the Station Master. On the westbound (Denbigh direction) platform a simple wooden waiting shelter was provided. Being in a rural location the station was also provided with a goods siding which included a cattle dock. 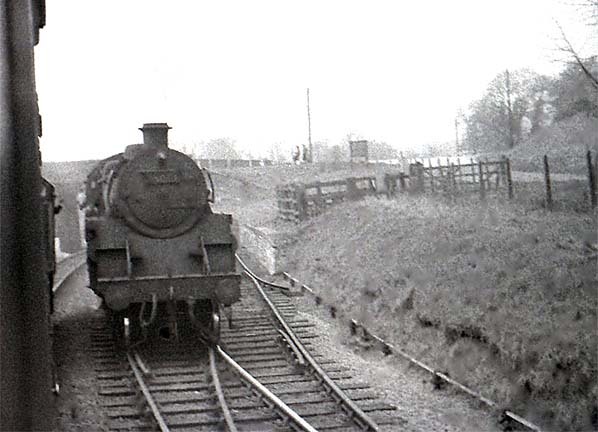 From the outset services were operated by the LNWR who by this time owned the Chester to Mold line which had an end on connection to the Mold & Denbigh Junction line at Mold. A 1904 timetable shows that Nannerch was served on weekdays by seven trains to Chester and seven trains to Denbigh. By 1919 an addition motor train served the station running twice per day between Mold and Denbigh. Additional services ran on Saturdays. The line retained its independence until the Railways Act of 1921 and in 1923 it became part of the London Midland Scottish Railway (LMS). In the first year of LMS ownership Nannerch saw an increase in train frequencies. Services were stepped up to eleven each weekday to both Chester and Denbigh. Some of the Denbigh services continued on to Ruthin and Corwen. By 1934 the service had improved even further with 13 trains in each direction. The line became part of the nationalized British Railways in 1948 and during that year Nannerch had eleven trains to Denbigh but only nine to Chester on weekdays. In 1953 scheduled passenger services between Denbigh and Corwen ceased. To compensate services running between Chester and Denbigh were extended to run to Ruthin. This became the pattern for the next nine years but by 1960 only nine trains ran daily between Monday and Saturday. By this time trains usually consisted of only two coaches. In 1961 the line was recommended for closure but local objections delayed the decision for one year. Nannerch Station closed on 28th of April 1962 along with the line between Rhydymwyn and Denbigh. Shortly after the tracks were lifted the station was converted into a private residence. 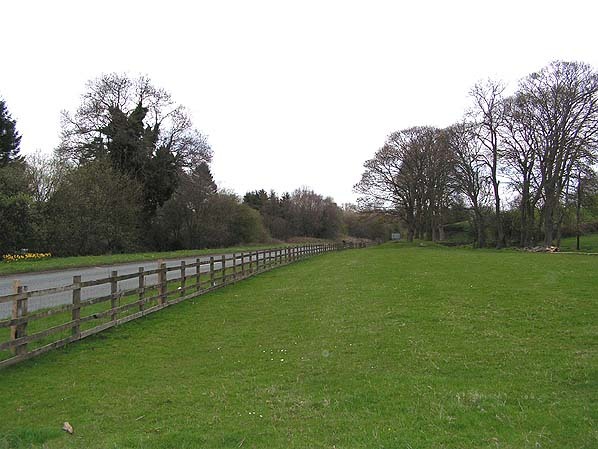 Not long after this conversion had been completed a compulsory purchase of the property was made by the highway authorities as they wished to demolish it to facilitate a realignment the A541. This work was duly carried out and today the A541 occupies part of the station site. Looking along the track bed towards the northwest showing the site of Nannerch Station in April 2008. 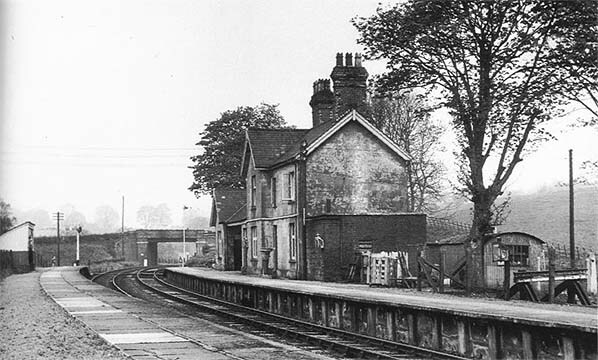 The station was demolished to facilitate the road realignment a few years after closure. The trees on the right hand side of the picture were located on the east side of the station forecourt and can be seen in the 1957 picture.